The white-tailed spider, a much feared spider, but for all the wrong reasons? White-tailed spiders are a ground dwelling spider which is aptly named after the white marking on the rear of it’s abdomen. They are a small spider (12-15mm in length, 28mm leg span), their cephalothorax (head/thorax) is dark brown to black and round in shape. The white-tailed spider’s abdomen is cigar shaped and grey in colour with the distinctive ‘white tail’. Their legs are a brown to reddish in with a ‘banded’ pattern. White-tailed spiders are at home under the bark of trees or roaming through leaf litter looking for a tasty meal. Their meal of preference is the black house spider, whom they trick by picking at the web imitating some trapped prey before pouncing on the emerging spider. Black house spiders, as the name suggests love to live around peoples houses! This and the humid, small cracks and crevices found within a house will often entice the opportunistic white-tailed spider in to your home. White-tailed spiders are a predatory spider who will often be seen roaming, especially at night, but due to their preference for dark cracks and crevices, are able to live within a house without sightings. 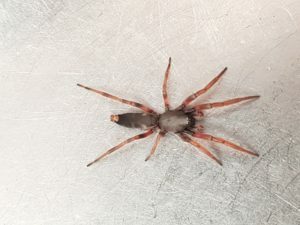 White-tailed spider bites invoke fear from the potential of a necrotic bite and reports of tissue ulcerations after a bite. While there are a lot of these type of bites reported, their have been studies conducted which conclude that this is not the case. The white-tailed spider is not an aggressive spider, but will bite if threatened. The majority of bites occur in peoples beds, or an item of clothing. While note being used, your bed sheets or folded clothes imitate the bark of trees, offering humidity, darkness and protection from predators. Once you hop in bed or try to put the item of clothing on, the spider will feel threatened and bite in defence. While there is no conclusive evidence linking white-tailed spiders to necrotic wounds, the reports are surely enough to avoid a white-tailed spider bite at all costs. At Local Pest Experts, our recommendation is to have one of our Expert cockroach and webbing spider treatments completed to gain control of white-tailed spiders. The webbing spider treatment will eliminate the black house spiders (the food source) and the internal crack and crevice treatment for the cockroaches, focuses it’s treatment on the harbourage sites of the white-tailed spiders, eliminating the activity already inside. For any further information or to make a booking, contact us.